GreenWorks Carpet Care cleans, disinfects and deodorizes your carpets safely removing harmful pollutants and abrasives from the carpet leaving your home feeling fresh and adding years of life to your carpets all using a natural citrus cleaning product! GreenWorks Carpet Care was established by local North Vancouver entrepreneur Sean Page, with over 10 years experience, Sean wanted to bring green technology to both home and commercial carpet cleaning in Vancouver. Today, the company offers numerous cleaning services in throughout Vancouver and Lower Mainland Area. Trained and certified technicians, advanced Rotovac 360i equipment, all-natural d-limonene extracted from food grade Florida oranges, transparent pricing and high quality customer service have ensured a reliable reputation and clientele for Green Works Carpet Care. We offer services that are soft on your carpets and tough on stains. Get in touch with us for more details about our home carpet cleaning in Vancouver and business carpet cleaning Vancouver service. At GreenWorks Carpet Care, we specialise in carpet cleaning Vancouver and cleaning area rugs, mattresses, leather, stains, odours, vehicle interiors, tiles, grout and upholstery in your home or office. We use d-limonene, the all-natural food grade orange extract, and the multidimensional cleaner Rotovac 360i for the most efficient cleaning. Our services extend over Vancouver, Burnaby, North Vancouver and West Vancouver, BC. Get in touch with us for expert home carpet cleaning or business carpet cleaning Vancouver. GreenWorks Carpet Care is an environmentally conscious company that focuses on green cleaning methods. We believe that we are equipped with three characteristics that give us an advantage over other cleaning services in Vancouver, Burnaby, North Vancouver and West Vancouver. We use only the highest quality green cleaning solutions extracted from food grade oranges. The product is all natural and comprises of active d-limonene that thoroughly cleans, disinfects and deodorises your carpets. After the cleaning process, your space smells fresh and crisp with a citrusy tang. Besides, the natural product is safe on fine fibers of your carpet. 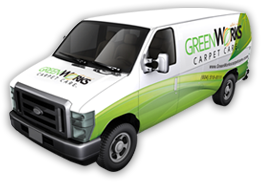 GreenWorks Carpet Care is an environmentally conscious company and focuses on green cleaning methods. We believe that we are equipped with three characteristics that give us an advantage over other cleaning services in Vancouver, Burnaby, North Vancouver and West Vancouver. Very professional owner operator. Trustworthy company and they did a capable job cleaning all the carpets in my home. Reasonably priced for a large job well done. Would recommend GreenWorks to my friends. This was the second time using them and they did another great job. Barbara Birt from North Vancouver. Thanks GreenWorks for a really great job on both our carpet and sofas. Your customer service and expertise are outstanding and I'll be sure to call you back again! Great professional service for years. Thank you. We had Greenworks clean our suite after our tenants moved out. We felt we would need to replace the wool, beige carpet that had marks all over it from a puppy they were leaving in the one room and ground in dirt as well as paint spots. Thanks to Greenworks, I am happy to say, we still have carpet in those rooms. Sean cleaned a small section of the porous, imperfect, slate flooring to show how well it could be cleaned and was able to clean the whole area that same day by working late. The capets and slate floor look nearly new thanks to long hours and hard work of Greenworks at a reasonable rate. It would have taken me several days and I would not have gotten the floors as clean (I am the type that usually does it myself as I am unhappy with the work of others). Sean also cleaned the rooms of our 1 year old and 3 year old as well as an area rug which they have had accidents (of all types) on and there are no spots. Our house smells much fresher. I highly recommend Greenworks and will call them again when we need our vehicle, furniture, or flooring done. I had to get some parts of my house's carpets cleaned after some huge stains from painting. They were able to remove the stains and it looked like those stains were never there. They were prompt and efficient, got the job done right on time and I would definitely hire them again, their costs were reasonable too. GreenWorks was able to get both the visible stains and the odor out of our spare room (cats had urinated). Tech was courteous, efficient, and an all around cool guy. I was very pleased with the service GreenWorks provided. The job was done thoroughly and professionally. The Technician was very curteous and trustworthy. Did a fanastic job cleaning my carpets. I would recommend him to family and friends. QUICK & EASY FREE QUOTE! If you are in need of home carpet cleaning or business carpet cleaning, please fill and submit our free, no obligation quote form.